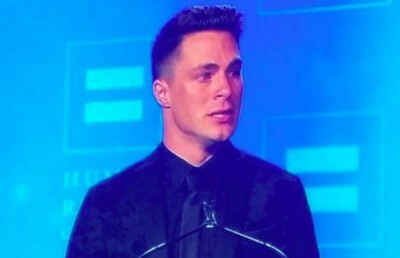 Colton Haynes traveled to Seattle over the weekend to accept the Human Rights Campaign Visibility Award – his first major award from an LGBT group. ‘Wow! I’ve experienced a lot of wow moments in my life, but tonight may top them all,’ he told the crowd. ‘Thank you for letting me feel your love. I hope you feel all of mine. Haynes, 28, came out publicly earlier this year and has been candid about his difficult journey to self-acceptance. ‘I don’t feel especially deserving of this recognition,’ he admitted. ‘We all know there are many others who have come before me to blaze the trail as LGBT advocates and role models. I am walking in their shoes and following their lead. ‘Instead, I will accept this award as a promise. My promise is simple and real, and I’m not making it to you. I want to make my promise to the next generation of lesbians and gay men, bisexuals and transgender youth. ‘I can’t promise them it will be easy or painless. I know they will have some dark places, and fears holding them back. Sometimes we listen to the wrong voices, the ones that tell you that “you can’t,” or “you shouldn’t.” We all do. ‘I couldn’t hold back the emotion. I don’t feel especially deserving of this recognition. We all know there are many others who have come before me to blaze the trail as LGBT advocates & role models. I am walking in their shoes and following their lead. His battle with anxiety had led the actor to leave regular roles on both Arrow and Teen Wolf. But he returns to television this fall with a role in Scream Queens. Earlier this summer, Haynes participated in a video released by HRC paying tribute to the 49 victims of the Orlando shooting at Pulse nightclub. He is ADORABLE but humble and he doesn’t have to be, if you know what I mean….He is so ‘FINE’ that he doesn’t have to be nice or even generous with his celebrity or his time and I feel that most would forgive him. He could have stayed-in-the-closet for some time and still many would have been ‘all-on-board’ with anything that he says or does but he chose to come out and allow others to feel this ‘sense of freedom’ which coming out gives you. Even if many people in your life are going to be a bit upset over your choice to be open, no one can take away the fact that your proud to be a member of this exclusive and sometimes ‘strangely beautiful club of people’ (LGTBQ community) that don’t always see eye-to-eye but have a way of somehow coming together when it’s necessary. This young man is the ‘bee’s knees’ all day and all night and young enough that he shouldn’t care and famous enough that he doesn’t have to be bothered trying to impress anyone but he chose to be vocal and supportive of the many that are in the walls of the community that feel so ‘let down’ by many others celebrities and public figures that don’t show any kind of compassion or empathy for their brothers and sisters in this fight for their lives……….It shouldn’t be this hard to be a member of the LGTBQ community in 2016 but it seems like instead of going forward and being progressive, we are going backward and a few steps away from the 50′s and 60′s…….I’m glad he is leading the new generation of LGTBQ people and being not just ‘eye-candy’ which I can’t help but feeling a bit besides myself seeing him ‘shirtless’ but hey I been single for some time (Colton holla’ at your boy, if you can). Seriously, I’m thankful that he is this amazing talent that feels this urge to be vocal, be visible and vigilant about others in this community of FABULOUS PEOPLE THAT DON’T ALWAYS KNOW THEY ARE FABULOUS……………..